We have good news for you if you are a Prime member and like to try different protein bars! 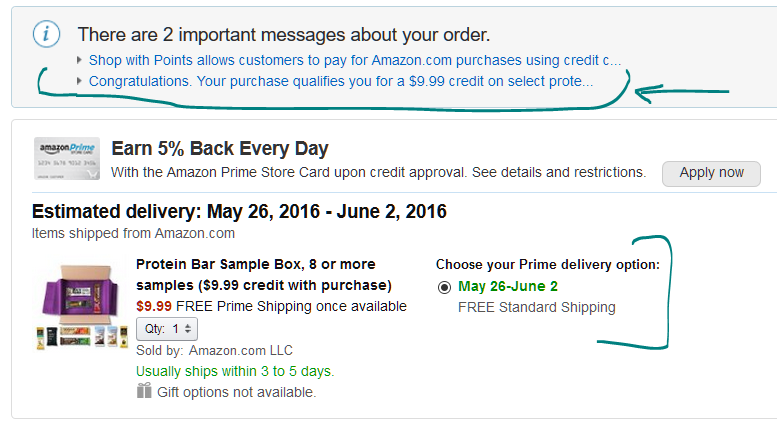 Amazon is expanding its “Sample Box with Credit” promotions. A few weeks ago we mentioned the K-Cup sampler promotion (currently unavailable). Now they are offering a similar promotion for protein bars. As you can see above, you don’t have any shipping customization options. There’s only one shipping option for these sampler boxes. It was the same thing with the previous K-Cup offer. Probably to cut costs and make this feasible financially. One strange thing is that I was charged sales tax even though these are food items. Not sure why, but it’s still a great deal regardless. I am placing an order for these, and will post an update (similar in style to the K-Cup post) once they arrive. The shipping estimate is 3-5 business days, so expect the post to come out next week.